Lawyers from the millennial generation are less "different" than their older colleagues might think, but the changes they do bring to the profession are positive. The myths of job hopping and self-centered workplace values are false. As director of career and professional development at the U.W. Law School, I advise this generation of students navigating the changed legal market. I also frequently interact with mid- and late-career lawyers and recruiters. As we confront this new and exciting legal market together, I see room for innovation. However, I see something getting in the way. Instead of focusing on the many aspects of law practice that have changed, I find many later-career lawyers focus on their perception that this generation of law student is somehow different. More often than not, these opinions skew negative – millennials aren’t loyal, millennials are entitled, millennials don’t want to pay their dues, and so on. The truth is, law students today want what all of us want. They are eager to add value, find purpose, and use their degree in fulfilling ways. I’ve become convinced that a focus on generational differences is unhelpful at best and counter-productive at worst. Lawyers would be better served focusing on the external forces that have changed the job market rather than on the shared characteristics of those joining it. In this column, I break down two myths about generational differences with specific respect to the legal field and discuss how employers can best respond to what is undoubtedly a changed market without reverting back to negative stereotypes about millennials. Finally, I address one very important reality about millennials. According to a National Association for Law Placement (NALP) Foundation Survey of the law school class of 2013 conducted in 2017, 32 percent of respondents reported they have held a single job since graduation. Thirty-seven percent of participating respondents reported they have held two jobs since graduation and 30 percent of respondents have had three or more jobs.2 These numbers are unsurprising. I often find myself not only advising students about what a first post-graduate job may look like but what that first post-graduate job means for the student’s chances of landing his or her dream career. For instance, a law student may dream of being an Assistant United States Attorney but realizes she will not walk out of the law school and into a federal courthouse appearing for the federal government. edu megan.heneke wisc Megan Heneke, Iowa 2009, is the director of career and professional development at the U.W. Law School. Before joining the U.W. Law School in 2014, she practiced law in Iowa. This long view is not unique to the law, and it is not unique to millennials. Early-career mobility exists across generations. In other words, millennial lawyers are switching jobs not because they are millennials, but because they are young. Job-hopping numbers were nearly identical for 20-somethings in the 1980s as they are today.3 This makes perfect sense. Many graduates realize they are not equipped with the skills or experience to immediately take on big cases and clients. They seek experiences that allow them to build their skills in entry-level environments and gain the confidence to advance in their careers. Many do this through clerkships or fellowships that are designed to be of a fixed duration, but there are not enough such opportunities, so some will also have to take those first steps at law firms. Early-career mobility is a necessary side effect of creating confident lawyers prepared to meet challenges and client demands. This reality can hardly be considered a negative thing. I applaud organizations taking innovative steps to improve morale among their employees, marketing themselves as a solid training opportunity to reach long-term goals, and taking mentoring seriously. I’d also venture to guess that the more organizations focus on training and professional development, the more likely it is that employees will grow and develop with the organization rather than take their skills elsewhere. However, I’d caution organizations against thinking that these programs are somehow a response only to what younger lawyers want. All employees crave this kind of value-centered workplace, which leads directly to the next myth. To the extent that an organization is thinking about its professional development and recruiting and retention strategies, it should focus on initiatives to make all employees feel their work has value and purpose. Accordingly, to the extent that an organization is thinking about its professional development and recruiting and retention strategies, it should focus on initiatives to make all employees feel their work has value and purpose. Although the myths of job hopping and self-centered millennials are demonstrably false, this is not to say that millennials, gen Xers, and boomers are all the same in every way – only that workplace culture differences have been overstated. There are meaningful differences between millennials and other generations that can manifest themselves in the workplace. However, contrary to popular media narrative, most of these differences will only improve the workplace. Most notably, the millennial generation is the most diverse adult demographic in American history, given that 44 percent of millennials are members of racial and ethnic minorities.9 As the largest and most diverse generation, millennials will be leading the diversity and inclusion charge in today’s workspace. Early-career mobility is a necessary side effect of creating confident lawyers prepared to meet challenges and client demands. This reality can hardly be considered a negative thing. Diversifying today’s workforce is particularly important in legal organizations. A diverse set of employees is imperative to building rapport and trust with clients across all legal practices and to bringing the most well-rounded opinions and perspectives to the table. Not only is diversifying the workspace the right thing to do, it also helps the bottom line. Clients are beginning to consider diversity and inclusion plans when selecting outside counsel, and one study found that companies in the “top quartile for racial and ethnic diversity are 35% more likely to have financial returns above industry medians.”10 Accordingly, millennials are changing the workplace – just not in many of the ways the popular media narrative would have us believe. In sum, recruiting and retaining millennial talent is not a mystery. The practice of law has changed. The world has changed. But those entering the workforce are looking for the same things as their parents and grandparents – respect, purpose, and belonging. What are your summer plans? Any family vacations coming up? In the early summer, my husband and I are travelling to the Galápagos Islands. I hope to see all the unique wildlife on the islands but am especially hoping to see giant tortoises, marine iguanas, and Galápagos penguins. When we get back, I hope to take advantage of all Madison in the summer has to offer. I love the Dane County Farmers’ Market, sharing a pitcher of Wisconsin beer with friends at the Memorial Union Terrace, long walks around the lakes, and Madison Mallards games. I also want to finally try stand-up paddle boarding for the first time. edu megan.heneke wisc Megan Heneke, U.W. Law School, Madison. 1 Richard Fry, Millennials Are the Largest Generation in the U.S. Labor Force, Pew Research Center (April 11, 2018). 2 NALP Foundation, “Study of Law School Alumni Employment and Satisfaction: Class of 2013,” at 10. 3 Ben Casselman, Enough Already About The Job-Hopping Millennials, FiveThirtyEight (March 7, 2016). 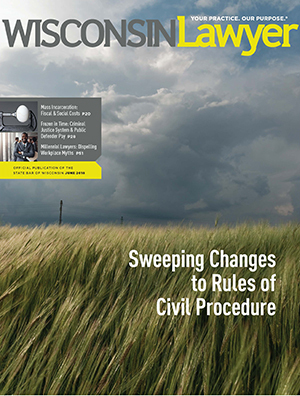 4 Mark Weber, Seven Changes in the Legal Job Market Impacting New Lawyers, Nat’l L.J. (March 30, 2018). 7 Bruce N. Pfau, What Do Millennials Really Want at Work? The Same Things the Rest of Us Do, Harv. Bus. Rev. (Oct. 5, 2017). 9 Brookings Metropolitan Policy Program, Millennials are the most diverse generation in U.S. history, now 44 percent minority, says new Brookings report (2018). 10 Ruchika Tulshyan, Racially Diverse Companies Outperform Industry Norms by 35%, Forbes (Feb. 13, 2015).